The Market Place Theatre in Armagh was packed to capacity on Tuesday evening for a special Advent evening that was hosted by Armagh Cathedrals Partnership. Those present were treated to an evening of music and a selection of readings and prayers celebrating Advent. The music was provided by the U3A Choir and also a Choir from St Catherine’s College. The guest speaker on the evening was Dr Francis Campbell, Vice – Chancellor of St Mary’s University, Twickenham, where he is also Professor of International Relations. 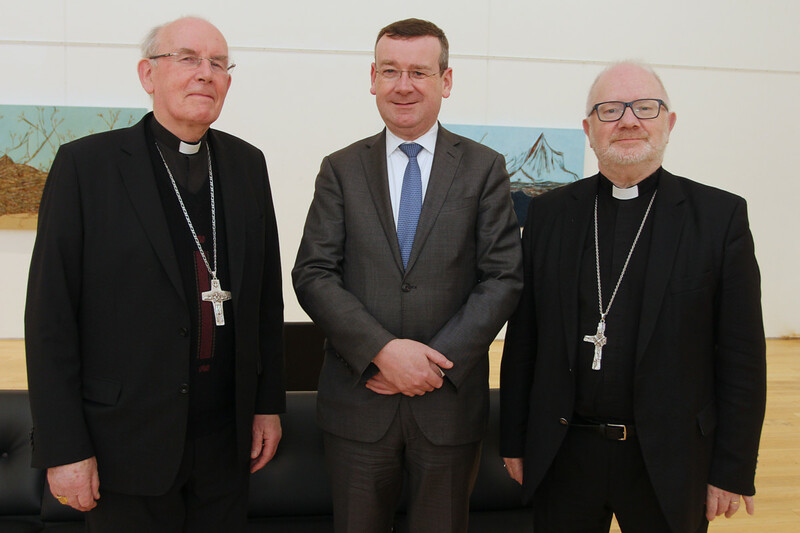 Cardinal Seán Brady, Archbishop Emeritus of Armagh and Archbishop Richard Clarke. Church of Ireland Archbishop of Armagh were both present on the evening. The theme for Dr Campbell’s presentation was: Living in uncertain times, the question is “How do we live for the Kingdom in a time of turmoil and how do we get our priorities right?” After his presentation, a pupil from each of the post-primary schools in Armagh put a question to Dr Campbell. The event was organised under the auspices of the Armagh Cathedrals Partnership.